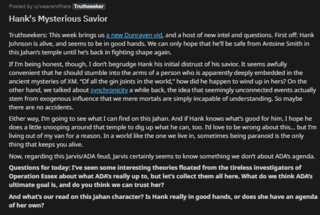 Truthseekers: Is it any wonder I don't know who to trust? I've got ADA whispering in one ear that Jarvis is the ultimate evil, while Jarvis is saying the same thing about her. But with every new piece of information I learn, it just reaffirms my decision to not take a side in this. 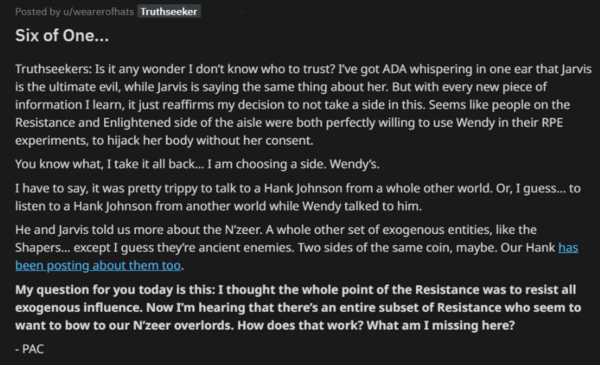 Seems like people on the Resistance and Enlightened side of the aisle were both perfectly willing to use Wendy in their RPE experiments, to hijack her body without her consent. You know what, I take it all back... I am choosing a side. Wendy's. I have to say, it was pretty trippy to talk to a Hank Johnson from a whole other world. Or, I guess... to listen to a Hank Johnson from another world while Wendy talked to him. He and Jarvis told us more about the N'zeer. A whole other set of exogenous entities, like the Shapers... except I guess they're ancient enemies. 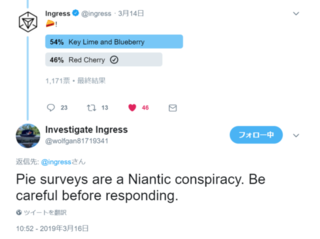 Two sides of the same coin, maybe. Our Hank has been posting about them too. My question for you today is this: I thought the whole point of the Resistance was to resist all exogenous influence. Now I'm hearing that there's an entire subset of Resistance who seem to want to bow to our N'zeer overlords. How does that work? What am I missing here?